There should be positives of a sort to be found in this result. 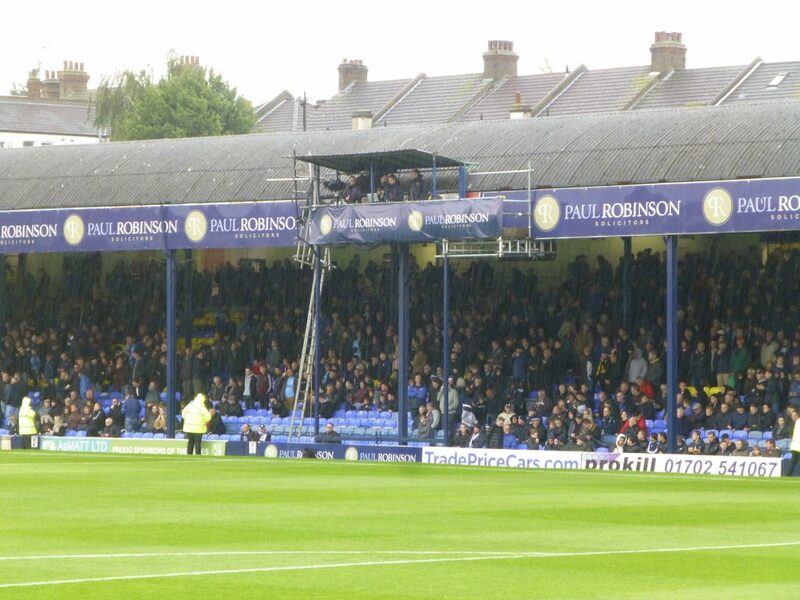 Roots Hall is rarely a happy hunting ground for us, with our last league win there being in 2003 under Ian Atkins, and the Shrimpers had won their previous three games. So we did well to get a draw and we also get a tick in the defensive job done box for keeping a clean sheet for only the second time in the league this season. Those positives though are really more than cancelled out by dropping into bottom spot courtesy of Plymouth beating Wimbledon. The stats don’t lie and make alarming reading. We’re maintaining a return of half a point a game. We’ve the worst goal difference. We’ve played more games than scored goals, although six teams are even worse than us in that regard. We’ve let in almost two a game and only Scunny and Rochdale have done worse, and then only marginally. Obviously it’s a combination of how well a team does both defensively and on the attacking front that determines where they ultimately end up. If you leak a few but are banging them in at the other end then no problem. If you hardly let any in and sneak a few goals here and there you should survive. So it’s not difficult to see why we are where we are. Our good defensive work on the day brought just the single point as we have no strike force of note, otherwise it could well have been three. Things like that will make a massive difference at the end of the season. Analysis at the final whistle though decrees that a draw was the right result for me. They had the first half, we had the second. In many matches I think the first 15 minutes or so are fairly even with each side not wanting to over commit and just play themselves in. Round about the twenty minute mark it often becomes clear which team is in the ascendency and that indicates which way that half, if not the entire match, will go. Here it was the home side who began to build their attacks closer to our goal and were beginning to find their men in our box. Just before the half hour mark Jason Demetriou laid the ball into the path of Simon Cox who had managed to become unmarked. Game up for us I thought as he absolutely leathered the thing. Crossbar and post decided, no. I wasn’t sure at that point whether this was just delaying the inevitable or it meant our luck would be in, because lucky we were. Most of the play was at our end as it also seemed to be in the second half too. I can’t recall us being much of a threat before the break (mind you are we really ever what you’d call a real threat?) but do seem to remember one excellent cross field ball from Ricky Holmes that found Gavin Whyte but the Southend goal didn’t end up being in any danger. After about thirty five minutes when a home player went down and required treatment I opted to visit the totally inadequate toilet facilities. Three cubicles and a trough that can accommodate just four is not good enough. Seeing the queue wasn’t moving much I walked back to the seats but as the injured player was still being attended to I re-joined the queue. By the time it was my turn I knew the game had re-started but felt no great desire to rush back, I was that uninspired by what I had seen thus far. I wasn’t the only one. As I wandered back there were people stood around chatting and getting food who didn’t seem bothered about watching football. On the subject of toilets, a slight digression. Not only do we get let down in ground after ground across the country but the rail network has a lot to answer for too. The train from Liverpool St to Southend Central took about an hour. There was one toilet on board. It was out of order. “Never mind we’ll use the one on the station when we get there”, people said. I wasn’t the most desperate. The one on the station was fenced off, closed for repairs. There are times when I think we live in a third world country. Not very convenient, unlike the Wetherspoons just across the road. Back to the football and the second half. We looked a different team, playing most of the game in our opponents half and taking the game to them. It’s not something we’ve seen that often on our recent travels. This didn’t mean that I thought we were going to score any time soon. We didn’t work keeper Mark Oxley. There were rare balls into the danger zone in their area but we don’t have a clinical finisher amongst us who reads those sort of things or knows when to gamble. What headers we had could be defended in run of the mill fashion until we’d just about got through to the end when Oxley had to pull off a very good reaction save to prevent John Mousinho getting on the score sheet. Having seen a replay though I wouldn’t quite call it the wonder save I thought it had been at the time. 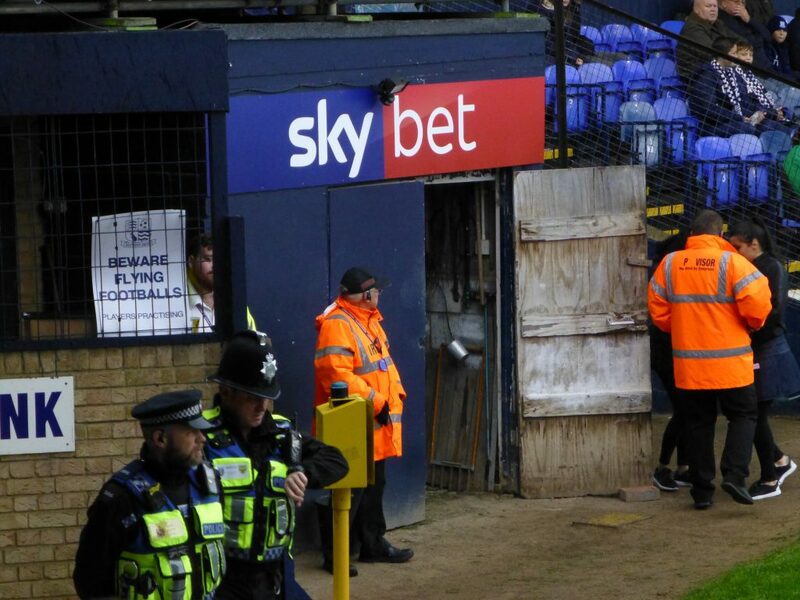 Although this in no way makes me think we’ve turned any meaningful corner, I didn’t get that strong feeling that we would fold right up to the finale as I had done against Luton. And that held true even when they had a free kick which they launched into our penalty area late on. Although it wouldn’t have been a total surprise of course. Defensively, whilst being far from perfect, this was a huge improvement. Josh Ruffels replaced Luke Garbutt at left back and I think it is fair to say he doesn’t look comfortable there. That position does seem to be a problematic one for us. Tony McMahon and Rob Dickie give the team some steel and with Jamie Mackie up top this type of thing may have rubbed off onto the others because for the first time in a while we weren’t noticeably the weaker and less determined side. We weren’t bullied as we often are. Mackie’s aggression was more controlled than when he appeared against the Hatters and his markers knew they’d been in a game. Although he’s not the answer to the goal scoring conundrum, I quite liked what I saw. With a bit of grit around him I think Curtis Nelson looks a better footballer. For months, if not longer, the question has been posed – wouldn’t we be better off with Mousinho in midfield? With him sitting in front of the back four we looked more solid and needed our captain to come up with a great saving tackle when we nearly got undone. Ironically I thought he dithered about less on the ball in midfield, where losing it is marginally less risky, than he does at the back, but he did do his usual in the second half when he was dispossessed by Dru Yearwood. Compared to recent games this one saw few bookings. Two for us and one for Southend’s Jason Demetriou who committed a foul on an Oxford player near the centre circle. I hadn’t spotted it as being any worse than much else that had gone on nor had I heard referee Craig Hicks’s whistle. As the ball immediately found its way to the right wing and we had what looked like a good chance of a genuine attack, I assumed it was advantage rule played. Holmes sprinted like a good un and got there first. Away he would have been if he’d not been taken out in dangerous fashion by a blue shirted defender who just launched himself. Thankfully it wasn’t the studs that took our man down. Red card all day long I thought. Then it became clear Hicks had penalised the first offender. He didn’t even have a word let alone show a card of either colour to the second offender. I’ve not trawled through the laws of the game but surely in such circumstances there’s not the option of a free hit where serious injury could be inflicted. It was cold, it was wet. We got soaked in the downpour walking back to the station with standing water on the road being propelled in vast quantity towards bedraggled pedestrians. This kind of summed up my mood on the season so far. But what I will do is take away a bit of hope based on the spirit we showed on Saturday. It is obvious we have not thrown in the towel (something we could have done with to dry off on the journey home) and although performances have told a different story, results suggest we’re not that far off. We’ve not lost a league game by more than one goal since we were walloped 4-1 at Pompey the third game into this campaign. Ignoring any miracles that might or might not happen in the January transfer window, the balance between optimism and pessimism that any Oxford fan will hold will depend on their view of the likelihood of a) keeping clean sheets / conceding few goals and b) solving our goal-scoring problems. I think there’s more chance of us achieving a) than b) but I wouldn’t put money on either being achieved. The cruel reality is that we are bottom and have a helluva task to escape. Given our situation I did a bit of research going back over the past ten seasons. After 12 games, five of the teams that were bottom ended up getting relegated. Points gained at that stage ranged from 5 to 10 with the average being 7.2. Average points gained by those clubs at the end of the season was 49.7 with a range of 34-73. Crewe featured three times and survived two. Plymouth’s achievement last season is still fresh in our minds as they ended up 7th and only failed to make the play-offs as they dropped away right at the end of the season. After their first dozen games they gained two points per match. I can’t see us doing similar I’m afraid. Another team was bottom on just five points after those early games in 2009/10. The name may surprise you, Southampton. They too got it together and raced through to seventh amassing an even more impressive total than Argyle, 73. It can be done, but they had Rickie Lambert banging them in. He got 31. At our current rate of scoring it will take the whole team 34 games to get that many. On that sobering thought, bye and keep the faith however hard it is at times. This entry was posted on Sunday, October 7th, 2018 at 6:55 pm and appears under Fan's View, News Items. Both comments and pings are currently closed.